The Back-to-School season is here and school districts are busy planning for the next academic year. For some school systems new transportation budgets may be identified, while others may need to replace old school buses unexpectedly. In either case, school districts and municipalities are increasingly looking for school buses with alternative fuel options, such as compressed natural gas, to support their sustainability efforts while decreasing fuel costs. “To support the school bus speciality market, Westport partners with Collins Bus Corporation, to provide dealers and school districts with 14 models of Type A school buses – from multi-function school activity buses to multi-purpose vehicle and child care bus models,” said Paul Shaffer, vice president and managing director of Westport’s Dallas operations. Safety – Westport WiNG™ Power System vehicles undergo the same safety testing for Ford original equipment manufacturer (OEM) vehicles. For school bus applications, Westport conducts additional rigorous Ford-approved testing. Warranty – Under Ford’s Qualified Vehicle Modifier (QVM) program, the Ford warranty remains intact (5-year/60,000 miles engine and powertrain warranty). Service – Westport partners with schools to set up the most comprehensive training, warranty and service program for their fleets. Dealers – Order and take delivery of your Collins NEXBUS® at any of the more than 50 Collins Bus dealer locations in the United States and Canada. 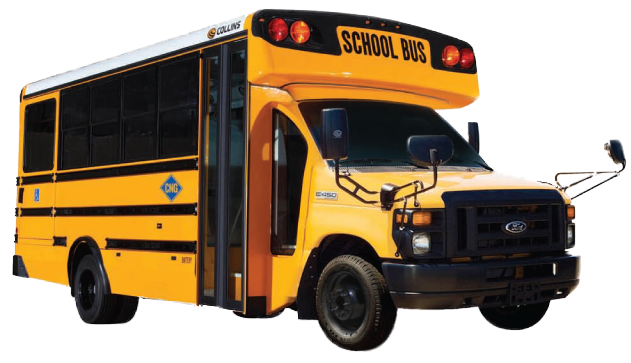 For more information about the Westport WiNG Power System and Collins Bus Type A School Buses, visit the Westport website.